Learn more about money, influence and who's wielding them at The Sunlight Foundation's Projects page. Our next meeting will be on Tuesday, April 9th at 7 PM at the Beverly Farms branch of the Library, 24 Vine Street. Special guest speaker will be Kate Machet, from Senator Edward Markey’s office, who will address the Green New Deal. We hope that many will attend. For more information or to add items to the agenda, contact Chairman Jim Thompson at tactech@comcast.net or 978-618-5188. Newcomers are always welcome! 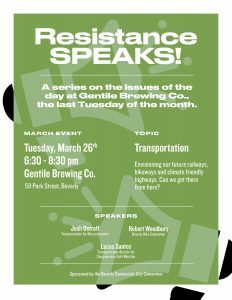 Please join us for another very interesting discussion, this time on the important subject of transportation. There will be a meeting of the Beverly Democratic City Committee on Tuesday, March 12 at 7 PM at the Beverly Farms Branch of the library, 24 Vine Street. Our guest speaker will be State Rep. Jerry Parisella. Hope many of you will attend! We will have a meeting on Tuesday, January 8, 2019 at the Beverly Farms Library, 24 Vine Street at 7 PM. For more information or to add items to the agenda, contact Chairman Jim Thompson at tactech@comcast.net or 978-618-5188. 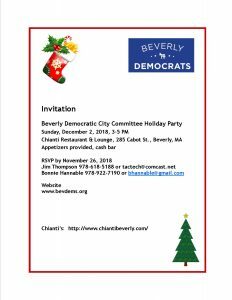 We’ll be having our holiday gathering on Sunday, Dec. 2nd from 3-5 PM at Chianti Restaurant & Lounge. Delicious appetizers, cash bar. Please join us, this is always a good time!